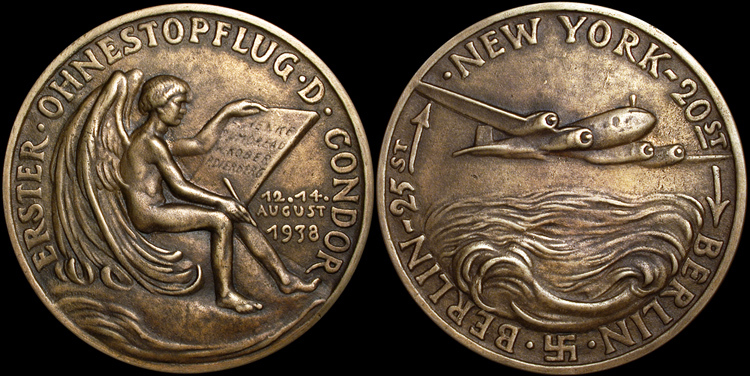 Obverse: “First non-stop flight of the Condor.” and dates. Inscription on slate held by angel on reverse: (names of the crew) "A. Henke, P.v. Moreau, W. Kober, P.Dierberg." Reverse: Condor over the Atlantic ocean. Commemorating the flight of August 12-14, 1938. Berlin-New York in 25 hours, and return flight New York-Berlin 20 hours.